The VIP Event is a stand alone event and will continue regardless of changes to the race schedule. We do not anticipate mailing tickets until April 2018 at this stage. 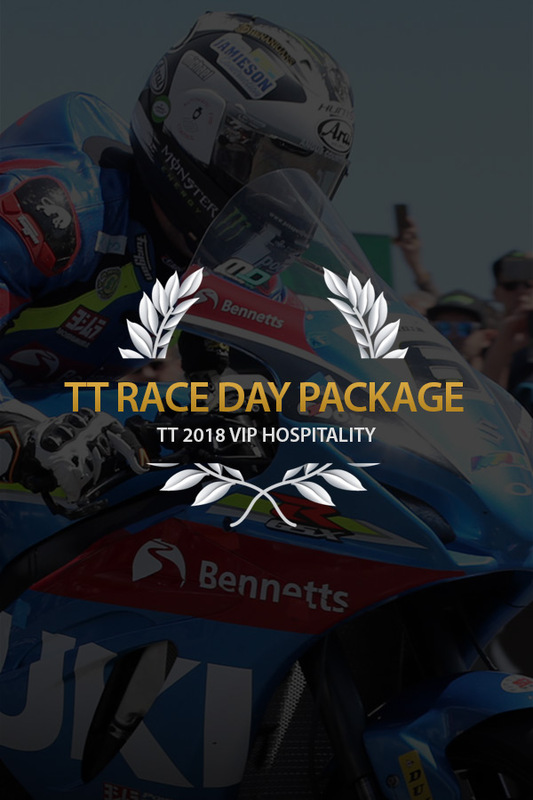 A great way to make TT 2018 fuelled by Monster Energy even more memorable: a superb VIP package. Your TT experience will be boosted with access to the exclusive VIP hospitality suite which is located right beside the course and the winners' enclosure - giving you privileged access to the most vital moments of the day. Watch the riders speed past at 170mph from the VIP Suite Grandstand*, following the race at it unfolds with live timing screens, you will receive a special souvenir gift pack including a programme and race guide. When the race is done your day continues in the VIP hospitality suite where you’ll be treated to a complimentary buffet with wine and beers from the fully licensed bar. Please note that the complimentary bar consists of beer, wine and soft drinks and spirits (subject to availability). You’ll be rubbing shoulders with people from across the world of real road racing and motorcycling including former world champions, team owners and many stars of the TT past. Regardless of background all eyes will be focused on the stage where, after each race, the winners will take part in an exclusive Question and Answer session for VIP ticket holders - you’ll get the inside line on what it takes to win on the 37 ¾ mile Mountain Course at speeds approaching 200mph. There will be plenty of opportunities to speak to TT riders, ask for autographs and maybe even have your picture taken with your hero! When you book your ticket you’ll receive confirmation by email, your VIP pack will be posted approximately four weeks before the event. Wherever possible dietary requirements will be met subject to at least 7 days notice being provided. Please note: The VIP Hospitality Suite is a licensed area. Because of this we sadly cannot allow any under 14s entrance to the VIP Suite. Thank you for your cooperation. Whilst every effort will be made to present the packages as described, the organisers reserve the right to alter where necessary the details of the packages whilst maintaining the value of any packages. The Organisers reserve the right to withdraw this hospitality offer from sale at any time. We regret that we cannot exchange, refund or transfer tickets. It is very important to double check all the event details and make sure you are 100% happy before going ahead and booking your tickets. Race Cancellation and Ticket Validity: Please note tickets for the VIP Suite are only valid for the date printed on the ticket. The Hospitality Suite will remain open as scheduled in the event of race cancellation or delay (due to weather or other circumstances beyond the reasonable control of the DED or its agents/suppliers) with extra entertainment laid on where possible. Previously this additional entertainment has included special guests, Q&A sessions with riders and team managers and displays of race bikes. No refunds will be offered. The VIP Event is a stand alone event and will continue regardless of changes to the race schedule. Refunds or exchanges are not permitted. your VIP hospitality ticket entitles you to a seat in the VIP Grandstand adjacent to the hospitality suite. Should you require a seat in the main grandstand you can purchase tickets at an additional cost (Subject to availability). Tickets for the Main Grandstand are only valid for the date displayed. In the event of the scheduled racing being postponed by up to 24 hours your Grandstand ticket will be honoured. Should the postponement be longer than 24 hours (ie Saturday to Monday) you will be required to purchase a new ticket (subject to availability). Please Note: You will receive a confirmation email and a dispatch notice at the time of you booking, tickets are not printed until closer to the event - we do not anticipate mailing tickets until April 2018 at this stage. This is part of Duke Marketing Purchase Policy and customers agree to this when purchasing tickets.